Canon PowerShot G1 X Mark III review: Can this compact truly replace a DSLR? The Canon PowerShot G1 X Mark III has successfully replaced our go-to DSLR for the past week, so it's more than up to the task. But it hasn't done so in like-for-like fashion, which makes it a good rather than outstanding camera overall. With budget compacts more or less killed off by the ever-advancing phone camera, dedicated cameras play a very different role these days. And as not everyone wants to lug around a massive lump, mirrorless and DSLR cameras simply won't suit all photographers all of the time. Which is where the Canon G1 X Mark III comes into play: this small-scale compact - which is a lot smaller than the MkII model - has what's known as an APS-C sensor at its heart, which is the same size and therefore quality as you'll find in Canon DSLR cameras. Which is kind of hard to believe, given how small the camera is. Which gave us an idea: why not ditch the usual DSLR for a week and shoot everything with the G1 X MkIII instead? That's meant plenty of product shots, both indoors and out, along with some casual photography over a long weekend in the country. Can the latest G1 X truly replace a DSLR camera, or are there too many compromises? What's special about the Canon G1X 3? As you can see from our in-hand photos, the G1 X III is a small-scale camera, at least in proportion to the sensor scale inside. The predecessor model has a smaller sensor (1.5-inch), but that was a far larger camera overall. Talk about progress, eh? There's seemingly nothing missing from the MkIII's setup either. With a vari-angle touchscreen and built-in electronic viewfinder, using the camera isn't a million miles away from a mini mirrorless or DSLR camera. Only you can't swap the lens, of course. The vari-angle screen we've found to be particularly useful for waist-level work, or when stowing the camera away and turning the screen in on itself to avoid scratches. It's a touchscreen, too, which makes light work of whizzing through the quick menu system to make settings adjustments, or for autofocus. There's also a Touch & Drag autofocus feature, which means you can press your eye against the viewfinder and use a finger on the screen to quickly move the autofocus point around. Thanks to the screen's vari-angle feature, it's potentially handy when the screen is protruding to the side (well, so long as you're right-eyed). However, when the screen is in its standard against-camera position, we found our face/nose would move the focus point way too easily. As camera go, the G1 X III's build quality feels second to none. We particularly like that Canon has avoided the cheap looking plastic that's used on many of its DSLR cameras, opting for a metal finish that exudes greater visual and physical quality. It's not too heavy overall either, at sub-400g, while the finish means dust- and drip-proofing to avoid nature's elements causing damage. As per other high-end compact cameras, the G1 X III comes with a mode dial, separate exposure compensation dial and front control ring. The exposure compensation we've been using constantly, which is super useful when shooting dark/light subjects against opposing backgrounds. The front control ring - which, in aperture priority mode, acts as the aperture control - is a little too nestled in against the grip, which we've found makes for accidental changes a little too often. Good as the build and operation are, however, the lens is, to some degree, the G1 X Mark 3's weak point. It's not that the quality is questionable, it's that the maximum aperture - i.e. the lens opening that lets light in to expose the sensor - is somewhat limited when extended. At its widest-angle 24mm it offers an f/2.8 aperture, which means lots of light can enter - which is useful for keeping the sensitivity settings low when there's not much light. All good there, then. It's when extending the lens through its zoom that the aperture dips down to f/5.6 at the 72mm equivalent. That means a whole lot less light reaches the sensor, which often means cranking up the ISO sensitivity to achieve the right exposure. We were taking some outdoor shots of statues and that meant having to ramp up the sensitivity to ISO 1600 to obtain a fast enough shutter speed for a sharp photo. Any small scale, large sensor camera is going to succombe to such compromise, in reality, so whether these limitations will restrict your kind of shooting will affect whether the latest G1 X III is the camera for you. We would also like the lens to move through its available focal length at greater speed. Using the single lens control ring - the G1 X III doesn't have dual lens rings like some earlier Canon cameras - the subtle zoom can be useful for smaller adjustments, but the toggle zoom atop the camera ought to be quicker at jumping between key focal lengths. 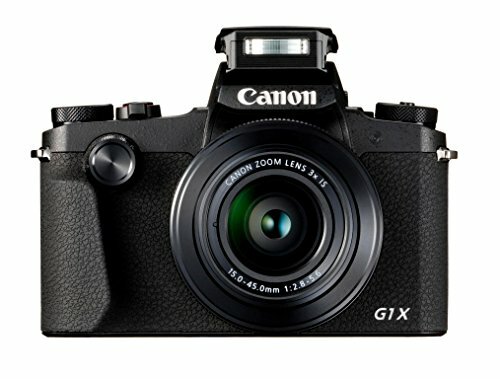 How does the Canon G1 X Mk3 perform? Other than the slightly slow lens zoom, the G1 X Mark III is quick in operation. This is thanks to Dual Pixel AF, meaning the sensor has on-surface phase-detection pixels for enhanced autofocus. It's the same feature that appears in Canon's DSLR line-up, when using such cameras in their live preview mode - and it works pretty well. As a result this G1 X is fairly snappy and capable of locking onto subjects. It's not as super-fast as a Canon DSLR's through-the-viewfinder form of use, however, so don't expect quite that level of precision. As with all Canon compacts, this also means a simplification of the available focus types. Expect auto with face detection, touch-to-focus, or individual selection of the 45 areas available. It's decent as compacts go, but at this price we'd like to see far more complex autofocus modes, such as a pinpoint option - like you'll get with Panasonic's G-series cameras. This has been a problem for some of our product photography: we had to shoot and re-shoot the Microsoft Surface Book 2, for example, due to the large focus area opting to focus behind where we had positioned it. Close-up focus is also limited. You'll need to select macro mode manually, as is necessary with Canon compact cameras, but even then the minimum focus distance of 35cm from lens at full extension isn't exactly macro. Again, that's to be expected with a large sensor compact. To counteract motion, the G1 X MkIII comes with Dual Sensing image stabilisation, meaning the camera uses a gyro in the lens to provide information to the sensor for optimised processing. There's not a huge amount of data about the specifics of Dual Sensing IS, but having shot handheld at 1/15th second in dark conditions, it certainly shows its worth in keeping things looking sharp. If you're seeking burst shooting capabilities, then a solid seven frames per second (7fps) burst mode is available with continuous autofocus, increasing to 9fps if you fix the focus. That's pretty high at this level, although continuous autofocus with Dual Pixel AF isn't quite perfect in our view. Again, it's not of a DSLR level. Other features include a physical built-in neutral density filter, which can be set to automatically position within the lens, along with Wi-Fi, Bluetooth (plus NFC) for quick sharing files via the smartphone app. There's also more control via the app, which adds autofocus control over Wi-Fi. If you're going to go large on such features then don't expect the battery to last for an age - not that the small li-ion battery inside is a particularly long-laster. With 125 shots snapped we were down to around a third power remaining, so the 200 shots per charge quote seems believable. You might want to grab a spare battery though - which will further push that already high price point. Does an APS-C sensor mean DSLR-like image quality? In terms of quality, Canon is gunning for the G1 X III to deliver the same results as you'd get from the EOS 80D. Given the right conditions, results between the two are close, but the DSLR has far greater potential thanks to interchangeable lenses - which can avoid the "aperture ceiling" that the G1 X III suffers. That said, even with the aperture pushing up the ISO sensitivity, shots at ISO 6400 using a pre-production camera still exuded plenty of detail, colour and clarity thanks to the large sensor size. We shot the colourful graphics of a retro pinball machine and the result was a step beyond what we had expected - which is the beauty of a sensor so large. With the final production camera in hand, shooting a laptop for review at ISO 2000 held up ample detail to be used full screen. Such a sensor also means greater potential control over shallow depth of field. Shooting stone dog statues, with critical focus, really set apart the eyes from the nose, which is more control than a lesser compact camera would offer. However, as we pointed out earlier, the close-up macro focus is somewhat limited and we've not been able to get ultra-sharp results having had the final production camera in hand. At the top-end of the sensitivity range ISO 25,600 is available, which isn't the write-off that it may sound. Detail is far "mushier" at this point, but the bookshelf shot we captured still awarded enough detail to the titles' spines for them to be legible. Overall, then, image quality is the G1 X III's forte. The limited aperture has a potential knock-on effect that may demand higher aperture settings, but given the scale of this sensor, being forced to raise the ISO sensitivity isn't always as bad as it might sound. On the video front, it's 1080p capture, which can utilise the Dual Sensing IS for better stabilisation. There's no 4K, but that's not something we expect to see outside of Canon's pro video range - as is the case in all its current cameras. In the world of compact cameras it's rare to find one with a sensor as large as an APS-C one - there's the never-been-followed-up Nikon Coolpix A from 2013, or the more recent Ricoh GR - and, until this third-gen Canon reared its head, there's never been one with a zoom lens. That in itself makes the G1 X III a milestone camera. And a hugely capable one when it comes to image quality. In the same breath, it's also a somewhat limited camera. The aperture limitation from the 24-72mm f/2.8-5.6 equivalent lens can be a little bit of an issue, the battery life is limited, while autofocus is quick but fairly simple and could do with some more complex and capable modes - just look at the Sony RX100 V to see how immense autofocus can be in a compact. Then there's the price point. At £1,149, the wannabe DSLR-replacement is every bit as pricey as a DSLR camera. Its small scale will excuse that for keen enthusiast buyers looking for a second camera, but for most the more versatile nature of a DSLR is unlikely to make the G1 X III a reality. The Canon PowerShot G1 X Mark III has successfully replaced our go-to DSLR for the past week, so it's more than up to the task. But it hasn't done so in like-for-like fashion, which makes it a good rather than outstanding camera. Some will love it, others will struggle to find justification for purchase. Its sensor might not be as large as the Canon, but if you're happy to spend a big chunk of cash on a compact then the Sony's smaller stature and impressive autofocus system give it sizeable appeal.